Michael Connelly's thirtieth novel is a bit of a curveball for long-time readers, but he absolutely smashes it out of the park. For the first time in many years, there's no Harry Bosch or Mickey Haller. Instead, a new hero, young detective Renee Ballard, a beach-loving Hawaiian who's been relegated to the midnight shift in Hollywood after speaking up against her former supervisor's sexual harassment. Ballard was a star on the rise, but now she's persona non grata with many former colleagues in the prestigious Robbery Homicide division. Instead, she spends the early hours of the morning being called out to all manner of incidents, beginning investigations before passing them on to the daytime detectives. She's a shepherd of crime, more than a crime solver. But Ballard won't allow her current situation to push her out of the police force. She's determined to make a difference, to help victims. Although she has a partner, the pair of detectives on 'the late show' (the nickname for the midnight shift) have to cover the entire week between them, so end up working some nights solo. Ballard's partner Jenkins is a solid detective, but is often now just punching the clock, eager to get home to spend time with his ailing wife. He doesn't share Ballard's burning drive to go the extra mile. When on one night there's a credit card theft, a trans prostitute is brutally beaten and put in a coma and a bar worker is caught up in a nightclub multiple murder, Ballard finds it hard to let either of the latter two cases go. Despite the fact that her old nemesis, Lieutenant Olivas, takes over the nightclub investigation with his crack RHD team, and makes it very clear he needs no help from her. Ballard is on the outside looking in, but won't let that stop her trying to find the truth. Even if it puts her career, and her own life, on the line. Connelly absolutely nails the tricky balance between familiarity and freshness with The Late Show. For long-time fans, Ballard has some Bosch-like characteristics (trouble with her superiors, extremely driven, solves crimes in LA) while being a fascinating, fully-formed character all of her own too. It's easy to see why The Late Show is already being touted as the start of a new series, rather than a standalone. Renee Ballard is a wonderfully intriguing character, who gets more and more interesting as the book goes on, and we learn a little more about her. She is fierce, has a different way of looking at the world, and faces issues as a female detective that haven’t been addressed in other Connelly tales. I was curious as to how Connelly might handle writing from the perspective of a female detective, but he does it with aplomb and authenticity (I understand the character was inspired in part by a real-life LAPD female detective who Connelly has known for many years). The Late Show starts well and gets even better as the pages turn, as we learn more about Ballard and her LA world, and are handcuffed by a sublimely wrought crime tale. A brilliant start to a new series from a true master of the craft. 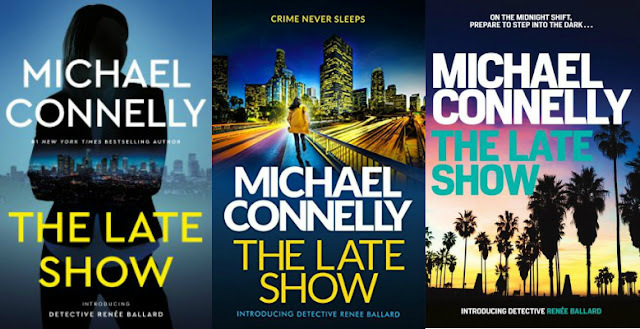 Note: The Late Show will be released by Orion Books on July 11 in the UK and Ireland, by Allen & Unwin on July 12 in Australia and New Zealand, and by Little, Brown & Company on July 18 in the USA and Canada.